Kitchen Remodeling in Fridley MN | Bannochie Builders Inc. The kitchen is always the heart of the home–it brings people and family members together. Whether you’re entertaining with some friends, or hosting a holiday party, the kitchen is the “go to” spot. 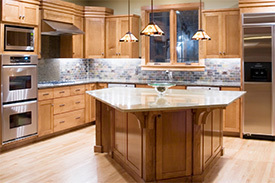 Bannochie Builders has been trusted with kitchen remodeling since 1995. No matter what style suites you–traditional, stylish, or contemporary–we can create or rebuild the perfect kitchen customized directly with your needs. We will turn your vision of a perfect kitchen into a reality. If you have been considering a kitchen remodel, but don’t know where to begin, we have the expertise to guide you through the process to design and create the kitchen you’ve always dreamed of. Our team of professionals at Bannochie Builders will work side by side with you to help choose the perfect cabinets, countertops, appliances, lighting, faucets, fixtures, ventilation, flooring, hardware, and accessories. If you’re looking for kitchen remodeling professionals, Bannochie Builders can help! Call our office today.